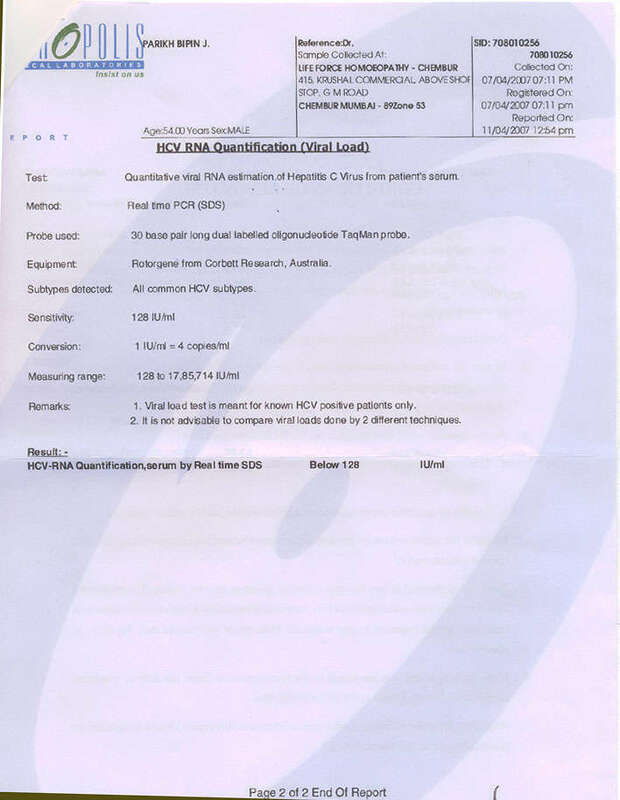 Mr B. P.,(PIN L-8786) with a roaring Hepatitis-C infection alongwith, cirrhosis of liver, finds his viral load within undetectable limits after homeopathic treatment. Mr. B. P. (Patient Referance no. 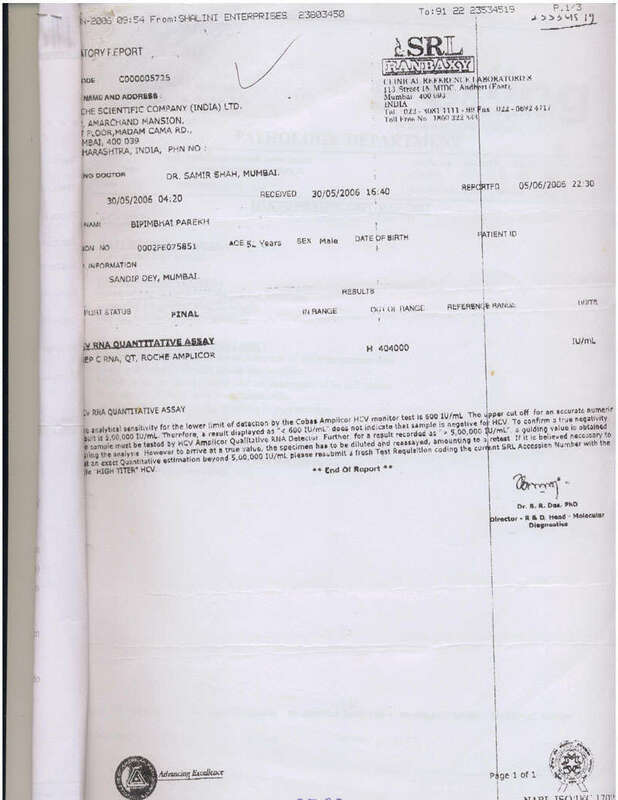 L-8786) was taken aback when he was detected with Hep-C along with cirrhosis of liver, in April 06. He hardly knew about the disease, then. Shocked and shaken with the condition, he consulted many physicians and gastroenterologists and was advised treatment with Interferon, but nobody would commit or assure him that these treatments will eradicate the Hep-C infection. He was told that despite taking the course of Injections, the virus can come back after a year or so. Dissappointed with this, he did not opt for those treatments. At that point, he came across with Dr Shah's treatment over the internet. When he visited our clinic, Life Force Center, he was pooled in by the information and research, that Dr Shah has made on Hepatitis-C. It assured him, that he was at the right place. His case details were taken. At that time his viral load was 404000. He had nausea, there was loss of appetite and a sense of lethargy. Sometimes, he would feel feverish in the evening, with tremendous weakness. His blood tests were done and noted. He and his family were explained in detail regarding Hep-C and guided properly throughout the treatment. He was prescribed Dr Shah's research based medicines for Hepatitis-C. In 8 weeks of treatment, the nausea stopped. The feverish feeling was less often. His appetite had improved. In the subsequent 4 months, the lethargy had reduced and the weakness had got better considerably. After 12 months of consistent treatment, his viral load was repeated and it was found to be within undetectable limits. At the start of the treatment, he was told that we could help to reduce the viral load substantially, but he was fortunate enough, as his viral load came to undetectable levels. The viral load had reduced from 404000 in May 06 to come within undetectable limits in April 07. Click here to view the report before treatment. Click here to view the report after treatment. This was not less than a miracle. He started feeling more active and once again, positive towards life. He was over joyed with the new lease of life that he had got!! He could not thank Dr Shah enough for this. This illustration is an excellent hallmark in homeopathy, which pinnacles its success in treating diseases like Hepatitis-C.